beautiful drive to a beautiful place, lovely garden walks, crafts and food. Westport House and adventure park, great day for children. The scenic drive to Westport via Louisburg is very picturesque. village is features Irelands only Fiord, Catamaran boat trips available and seaweed baths. 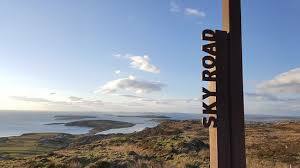 Locally there is a scenic trail to the next village Cornamona with spectacular views of Lough Corrib. I hope you get to enjoy some of these gems. Our very own little gem that is a favourite with our guests young and not so young guests, the looped trail takes you through the woodlands and out to a point at the lakeshore with spectacular views. It can be either a romantic stroll or a kid’s adventure. Locally there is an abundance of walking & Hiking trails, the stunning “Sean Bothar” (Gaelic for the Old Road) is a 10 Km walk from Clonbur to Cornamona and can be accessed nearby, the entire route overlooks Lough Corrib. For the more energetic Hill climbing is a must at “Mount Gable”, a worthwhile climb to panoramic views of both the lakes & mountains. Bicycles are available for hire at Dooroy Lodge. Adults & Children. This is an ideal base for touring the delights of Cong, Connemara & Connemara National Park, Leenane and Killary Fjord, Kylemore Abbey & Gardens, Clifden and the Sky road, Westport & Galway city, all of which are within an hours drive. Locally both Cong & Clonbur offer a variety of pubs & dining experiences from cafes to bar food & restaurants. Live traditional music sessions are held most weekends and additional nights in the summer season. There is a local Taxi service in Clonbur. There is a Tourist office in Cong. With Lough Corrib quite literally on your doorstep, we cannot make life easlier for fishermen. Our Boathouse & Pier at Dooroy Lodge are available to guests, with lake boats available for hire. The fishing in the area is second to none in the world. The season extends from February to end of September (the dapping season from mid May to mid June), using mayfly and from mid July to mid September. We are delighted to offer guidance and local ghillies (fishing guides) can be arranged. A salmon licence for river fishing may be purchased in the local villages. Connemara National Park covers some 2,957 hectares of scenic mountains, expanses of bogs, heaths, grasslands and woodlands. Some of the Park’s mountains are part of the famous Twelve Bens. Entry to the park is free and there is a newly constructed playground for children. There is a very nice visitor centre with refreshments available. There are some majestic walks to suit all levels. There is a path which leads all the way to the top of the ‘Diamond”, a great challenge’. Kylemore Abbey is the oldest of the Irish Benedictine Abbeys. The Community of nuns, who have resided here since 1920, have a long history stretching back almost three hundred and forty years. The Visitor Centre welcomes visitors on a daily basis. There is a twelve-minute video which is available in three languages. Glasilaun beach is a natural beauty. Always golden sand even in high tide it’s set on a gentle inlet which makes the water very calm. Some fantastic snorkelling of rocks and kelp. Approx 50 minutes drive. Lettergesh beach. Great waves for body boarding with an offshore breeze. Dogs Bay at Roundstone. Beautiful cove with some lovely rocks for snorkelling around. Approx. 50 minutes drive. based on Ireland’s only Fjord – The Killary Fjord – in Leenane, surrounded by some of the most idyllic scenery that Connemara has to offer. High Octane bungee jumps, a gentle cycling or walking tour through the Irish countryside, an exciting & energetic trip, Skiing, Surfing, thrilling new adventures, with over 25 years of experience. Experience the great outdoors. Whether it’s climbing to the top of Mweelrea, the highest mountain in the West of Ireland, catching your first surf break on the breathtaking Cross beach, or sea kayaking through the majestic Killary Fjord. Over 25 ocean, forest, and Mountain based activities. Not to be missed “Dooroy Nature Trail” can be enjoyed by our guests, this looped trail takes you through the woodlands and out to a point at the lakeshore with truly spectacular views and absolute tranquillity. This can be either a romantic stroll or kid’s big adventure. Locally there is an abundance of walking trails, the stunning “Sean Bothar” (Gaelic for the Old Road) is a 10 Km walk from Clonbur to Cornamona and can be accessed nearby, the entire route overlooks Lough Corrib. For the more energetic Hill climbing is a must at “Mount Gable”, a worthwhile climb to panoramic views of both the lakes & mountains. TOURING This is an ideal base for touring the delights of Cong, Connemara & Connemara National Park, Leenane and Killary Fjord, Kylemore Abbey & Gardens, Clifden and the Sky road, Westport & Galway city, all of which are within an hours drive. Locally both Cong & Clonbur offer a variety of pubs & dining experiencesfrom cafes to bar food & restaurants. Live traditional music sessions are held most weekends and additional nights in the summer season. There is a local Taxi service in Clonbur. There is a Tourist office in Cong. FAMOUS FOR FISHING Fishing on Lough Corrib & Lough Mask. With Lough Corrib quite literally on your doorstep, we can not make life easlier for fishermen. Our Boathouse & Pier at Dooroy Lodge are available to guests, with lake boats available for hire. The fishing in the area is second to none in the world. The season extends from February to end of September (the dapping season from mid May to mid June), using mayfly and from mid July to mid September. We are delighted to offer guidance and local ghillies (fishing guides) can be arranged. A salmon licence may be purchased in the local villages. Connemara National Park Connemara National Park covers some 2,957 hectares of scenic mountains, expanses of bogs, heaths, grasslands and woodlands. Some of the Park’s mountains are part of the famous Twelve Bens. Entry to the park is free and there is a newly constructed playground for children. There is a very nice visitor centre with refreshments available. There are some majestic walks to suit all levels. There is a path which leads all the way to the top of the ‘Diamond’. Sea Beaches Glasilaun beach is a natural beauty. Always golden sand even in high tide it’s set on a gentle inlet which makes the water very calm. Some fantastic snorkelling of rocks and kelp. Approx 50 minutes drive. Lettergesh beach. Great waves for body boarding with an offshore breeze. Dogs Bay at Roundstone. Beautiful cove with some lovely rocks for snorkelling around. Approx. 50 minutes drive. Bike hire firms offer a range of bicycles for your cycling needs. Drop and collection services are offered by some firms.